A fellow beekeeper recently summarized it well: “It’s a bee-itch to love a bug.” So so so true, especially this time of year. Mite counts are soaring–are you testing, and treating if need bee? A count can go out of control real quickly in a strong colony, because it may be robbing from weaker colonies (who have counts way out of control.) And there’s plenty of robbing going on, with the thieves not only wasps and hornets, but also friendly turned frenzied honeybees. Why is robbing so pronounced? Nectar and pollen are nearly done. Honeybees (and all other stinging insects that, well, bee) are frantic to stock their cupboards or enjoy a last supper before fall frost zaps them. Talking with beekeepers, colonies are being robbed with frenzy, determination and massive fatalities. The pictures are of a bottom board of a weak nuc hive we had, er, have. Even though we’d reduced the entrance, raiders were lined up to steal their stores. You could see bees wrestling each other outside the entrance. 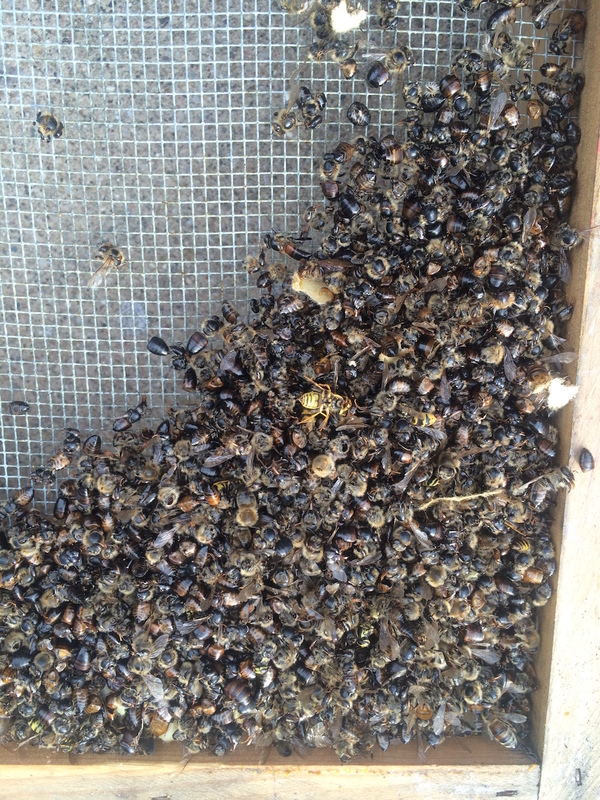 Many battles ensued; many bees were dismembered, as seen in the picture. Yellowjackets and other wasps and hornets joined the fight. Another tell-tale sign of robbing is that the bees are black and shiny: they lost their fuzz in the skirmish. We stopped the raiding by reducing the entrance to about a half inch so that the colony could more easily defend their doorway, but their honey pantry is fairly empty and their ranks decimated. 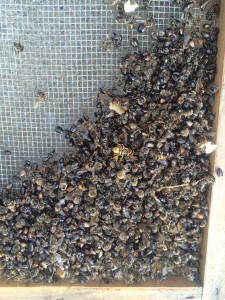 It may be too late for them, but we don’t dare open other colonies to redistribute brood, honey, etc. to them–because there’s such crazy robbing going on right now. Argh. The theory is that after a few days the robbers will give up. Fingers crossed. Reduce entrances, even on the strong colonies. Don’t open-feed unless it is far far away from your apiary. If you need to feed a colony (and plenty of us are feeding some of ours to ensure sufficient stores this winter), put the feeder OVER the top cover, with a box around it and all upper entrances closed. (And of course, the top cover on all that.) Not only do you have a taller, more impressive looking colony :), but bees can get the feed even if it is cold and rainy without having to defend it. Consider robbing screens. Google to find lots of instructions for making your own or buying them. You’ve gotten your winged darlings this far. Winter is a challenge, but not if you work with them now to ensure they’re healthy and strong.